Ah, l’amour. They say the French know it best and, even though Quebecois is not quite the same as French, novice Quebec-born filmmaker, Xavier Dolan, seems to have a pretty strong handle on the whole thing. Not only does he know love and the many places it takes us in our heads, but he also knows a thing or two about how to put together one fine film on the subject. His second feature, HEARTBEATS, confirms his position as one of Canada’s most promising new filmmakers. At 22 years old, I knew nothing about love. Dolan at 22 however, knows that love is what we make of it. Repeating the impressive triple threat he blasted on to the Canadian film scene with in his first feature, J’AI TUE MA MERE (I KILLED MY MOTHER), Dolan also writes and stars in this part farce, part exploration of love’s depths. 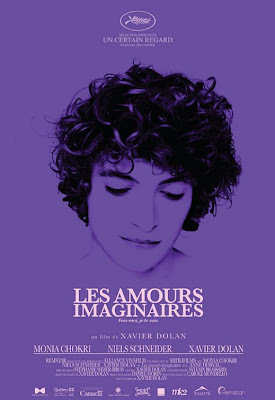 He plays Francis, a young, gay Montrealer who shares a friendship based mostly on cynicism with Marie (Monia Chokri), an impeccably dressed neurotic. One fated evening, they both meet Nicolas (Niels Schneider). He is handsome and captivating and it isn’t long before they are both trying to get him to notice them. As I’m sure you can imagine, this takes a toll on their friendship. HEARTBEATS is enchanting. Dolan channels the French “New Wave” and taps into his admiration for Wong Kar-Wai, creating a picture that is sumptuous and romantic but yet still realistic. His understanding of each step love takes upon its journey is uncanny, making it easy to remember exactly what its like to want a love that you can’t have and just how far people will go to realize it won’t work. Sometimes love may feel right in our hearts but Dolan reminds us that it might also just be entirely imagined. How many sheep would you give Heartbeats?